You know that a flat iron can help you get straight, smooth hair. But did you know that you can also use a flat iron to create curls? It seems wacky, but it’s true. In fact, if you want to get beachy waves or springy curls, a flat iron can be the way to go. Check out the best flat iron for curling hair and give it a try yourself. Plate size – Look for flat irons with plates that are no more than 1-inch wide. Each of the flat irons we reviewed contains 1-inch plates. Rounded shape – This isn’t a dealbreaker, but a nice to have. 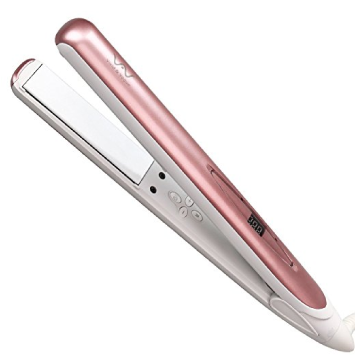 The VAV flat iron was the most round of our top picks. The KIPOZI and the Remington flat irons were also somewhat round. Plate material – Go for tourmaline coated ceramic or titanium coated ceramic if possible. The KIPOZI Pro Flat Iron has titanium plates while the rest of our picks feature tourmaline ceramic. Beware the heat when using the flat iron! 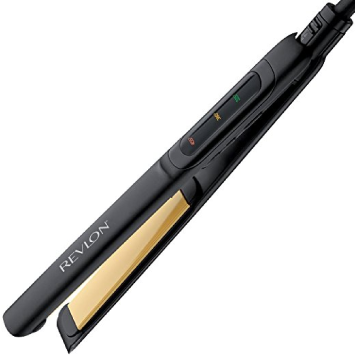 The Revlon straightening and curling flat iron gets up to 455 degrees, the hottest of all. Such a high heat might be too much for the average person, though. The KIPOZI heats up to 450, as does the MHD. The Remington is the coolest of the bunch, only reaching a top temperature of 410 degrees. The KIPOZI Pro Flat Iron has a lot to recommend it as a best flat iron for curling hair. The tool’s manufacturer even goes so far as to call it a two-in-one tool, ideal for both straightening and curling hair. The plates on the flat iron are the ideal size for curling hair – 1 inch. 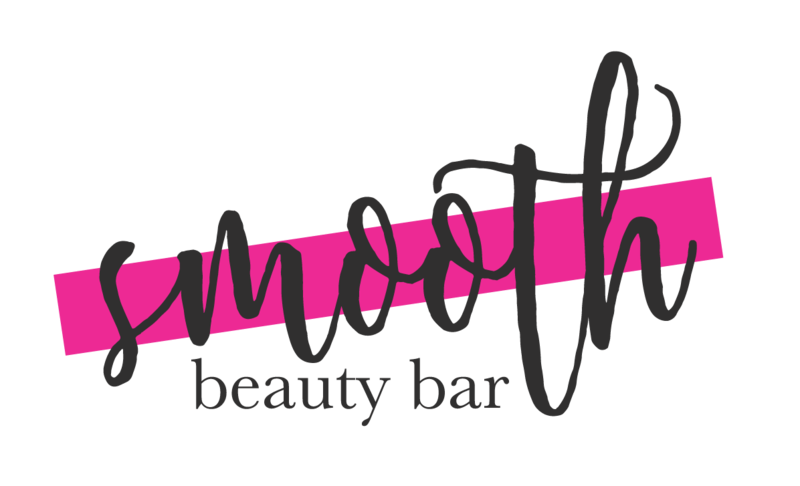 The tool itself has a rounded body, which can help create the shape of your curls. Another feature of the KIPOZI flat iron that makes it ideal for curling hair is the titanium plates that claim to release negative ions, which help to smooth the hair and minimize frizz. 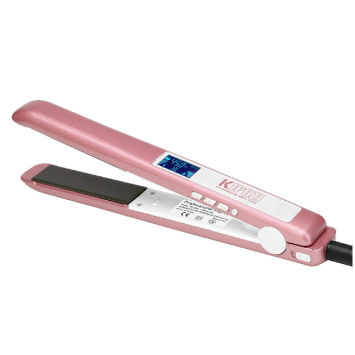 Choosing the right heat setting on a flat iron can be a challenge, but the KIPOZI makes it easy. It has a digital display that shows you a range of temperatures for different hair types (the options are fragile, damaged and “healthy” hair). 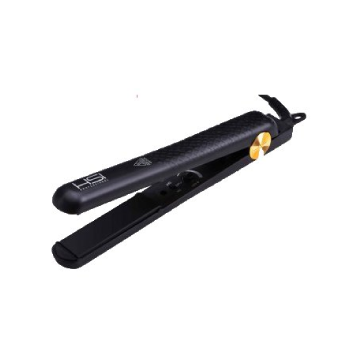 The flat iron is dual voltage for use around the world, and it heats up quickly. It also has a few safety features, including auto shut-off and a lock. People who’ve used the flat iron have been happy with the quality of the curls it created and with the ease of using it to create curls (rather than just straighten hair). One complaint that people have had is that it’s easy to adjust the heat settings accidentally while using the device. The HSI Professional Glider flat iron hair straightener has adjustable temperature settings from 140-450°F which gives greater control to achieve a perfectly sleek and smooth look for all hair types. It creates dramatic results on even the frizziest coarsest hair; to quickly straighten, flip, and curl with minimal effort. What’s great is that the HSI has micro sensor which helps regulate the temperature & evenly distribute heat so fewer passes are needed on your hair. The plates on the flat iron are made of ceramic and tourmaline crystal ion plates to create a shinier, silkier finish in less time.. The ceramic allows for even heating while the tourmaline crystal ion helps to keep your hair smooth and frizz-free. The relatively small size of the plates makes it easy to create waves or tighter curls with the flat iron and the subtly rounded top and bottom help to improve the shape of your curls. 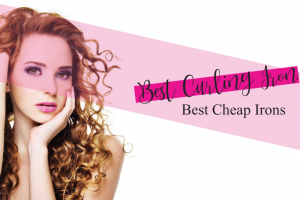 People who like the flat iron claim that it creates long-lasting curls in their hair and a few have even gone so far as to say that they’ll never use a curling iron again. The Revlon Straightening and Curling Ceramic Flat Iron has the fastest heating time we’ve seen – just 15 seconds. It also heats up super-hot — to up to 455 degrees Fahrenheit. Of course, we don’t recommend using your flat iron to curl hair on that high of a setting unless you really know what you are doing! If you don’t want to use the highest heat setting to fry — we mean curl — your hair, the flat iron offers a total of 10 settings which are customizable and displayed on the tool with LED lights. The 1-inch plates on the flat iron are ceramic with a Tourmaline coating, which helps to reduce frizz, protect your hair, and boost shine. While some people find that the flat iron is great for curling hair, others complain that it’s too slippery to use and that their hair falls right out without getting any waves or curls. One feature that users liked was the fact that the flat iron “remembers” the heat setting they used last so that they don’t have to toggle through a bunch of different settings each time they turn the iron on. The VAV Professional Hair Straightener can create long-lasting curls, thanks to its tourmaline coated 3D floating plates. The tool heats up quickly, in 30 seconds, and can reach a top temperature of 446 degrees Fahrenheit. The coolest setting is 284 degrees. One feature that makes the VAV flat iron particularly excellent as a tool for curling your hair is the very rounded shape of its body. You won’t end up with weird kinks or creases in your hair when you use this flat iron to curl your hair. Another feature that makes it ideal for curls is the floating plates. Some users have said that the plates are great for curls, although they do find them to be a bit long. While many people are happy with the flat iron for straightening and curling their hair, some find that it shuts off easily without warning. Others have complained about the heat, claiming that it gets too hot. The MHD flat iron also has floating plates, which makes it ideal for curling hair. Thanks to the floating plates, hair is less likely to get caught or snag while you run it through the flat iron. The ceramic plates are coated with Tourmaline and claim to release negative ions to help the cuticles of your hair strands lie flat, increasing shine. A few other notable things about the MHD flat iron are the safety features, including an auto shut-off feature and a lock to keep the flat iron closed when not in use. Although the tool heats up to 450 degrees Fahrenheit, it’s pretty limited when it comes to heat settings. You can choose between three settings – 250 degrees, 360 degrees and 450 degrees, which might not be enough depending on your hair type and styling goals. Users of the flat iron have called it an awesome product and have noted that it doesn’t pull on their hair. Of course, you can’t please everyone. Some have claimed that the flat iron makes a weird noise when using it. Others have complained about the limited heat options and noted that the plates on the flat iron began chipping right away. Why Use a Flat Iron to Curl Hair? 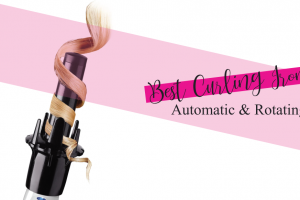 There are a few reasons why a flat iron can be ideal for curling hair. First off, the plates of a flat iron usually heat evenly, which can help set the curl. Additionally, using a flat iron to curl your hair eliminates the need to purchase a bunch of additional tools. You can use your flat iron for straightening when needed and for making waves when you wish. Flat irons can also create a wider range of curls that many curling irons, so you don’t have to worry about buying an interchangeable curling iron set or about buying two or three separate tools. Start with clean, dry hair and make sure to spray your hair with a heat protectant. Flat irons get pretty hot, and you don’t want to end up with crispy, fried hair. 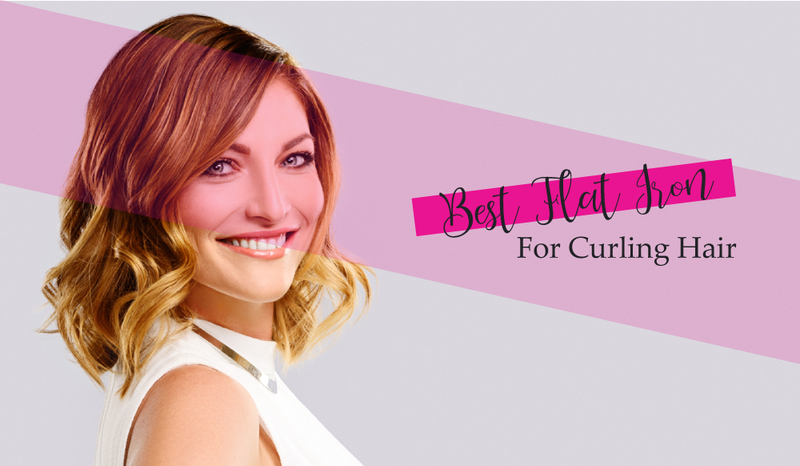 Whether you curl small sections of hair or larger ones depends on the type of curls you want to create. If your goal is tight, springy curls, work with smaller sections. If you want to create loose waves, use larger sections. Hold the flat iron near your scalp or the roots of your hair. Put one section of your hair between the two plates, then wrap the section around the flat iron. Wrap the hair in the direction away from your face to create natural looking curls. Once the hair is wrapped around the tool, pull the flat iron down the length hair to create a curl. Repeat with the remaining sections. You can vary the size of the sections if you want to create a more natural, tousled look. When you’re first getting used to using the best flat iron for curling hair, it’s a good idea to practice with the iron unplugged. That way, you can get a feel for using the tool without the risk of burning your hair! We also strongly recommend always using a heat protectant spray, even if you think your hair doesn’t need one. Skipping the spray once might be fine, but if you curl your hair on a regular basis, you’ll start seeing the effects if you don’t use it regularly. How quickly you pull the flat iron through your hair plays a role in determining how springy the curl is. Go very fast if you want waves and a bit more slowly to create tighter curls. Finally, remember that the hair needs to be in contact with the plates of the flat iron. Don’t put more hair in the flat iron than the width of the plates. The KIPOZI Pro Flat Iron has a lot to offer when it comes to curling your hair, which is why it’s our top pick for the best flat iron for curling hair. 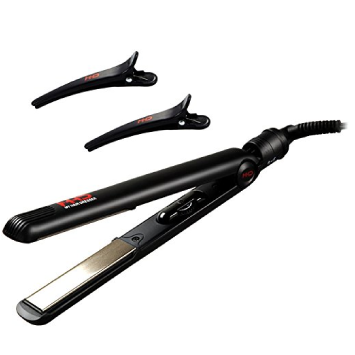 Its range of heat settings, shape and floating plates allow you to use to curl hair with ease.